We wrote about the PogoPlug NAS adapter in January, and I was excited to see what it could do. I finally got my review model, and this little gadget does a pretty good job of living up to the hype. The PogoPlug itself is the size of a large wall-wart AC adapter. It’s hefty, but not overly heavy. It seems well constructed. Set up is so easy that the PogoPlug marketing team issued a small challenge: can you finish installing the PogoPlug before you could pop a bag of microwave popcorn? They even included a bag of microwave popcorn. The answer? Yes, you absolutely can install and configure the PogoPlug before that sweet buttery goodness is ready for consumption. You plug in the PogoPlug, connect it to your router and some USB media. Then from your desktop or laptop computer you visit https://my.pogoplug.com/ (bonus points to them for offering an HTTPS connection for login!). Create your account by entering your email and selecting a password. Then type in the 25 character unique identifier for your PogoPlug, found on a sticker on the device itself. That’s it. You’re done. I was able to key in the 25 character ID, but I did find it somewhat tedious. Why couldn’t they just use the MAC address of the Ethernet card as the unique identifier? That’d save some typing, and further speed up the installation and registration process. 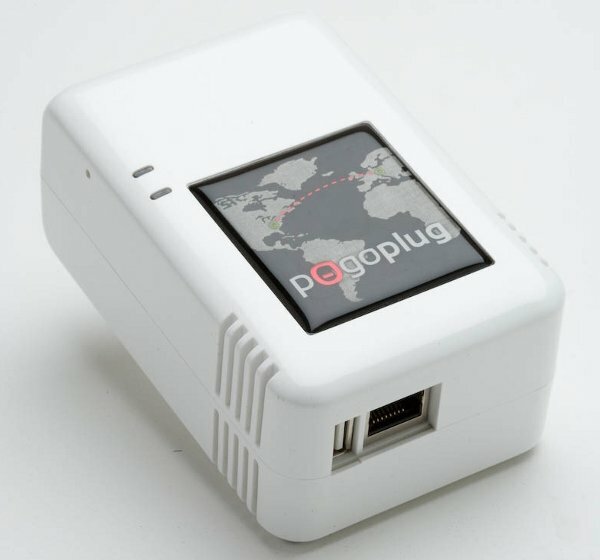 You can access your PogoPlug exclusively through the my.pogoplug.com website, which makes this thing super easy to use. Within seconds I had created a couple of folders on the media I had attached to it. Primary controls are at the bottom of the screen. You can select from several list styles, upload new files, create new directories, copy files around on the device, and define sharing options for selected media. You can only share on a per-directory basis, so keep that in mind as you organize your content for sharing with others. There are only four options: download, share, rename and delete. Those four are usually all you’ll need. The email address(es) with which you share items will all be mailed a simple link. All the recipients need to do is click the link to access the shared items. No fussing around with accounts, passwords, or access codes. They can bookmark the link for future use. You can elect whether to grant the user upload privileges, or whether they should have read-only access. 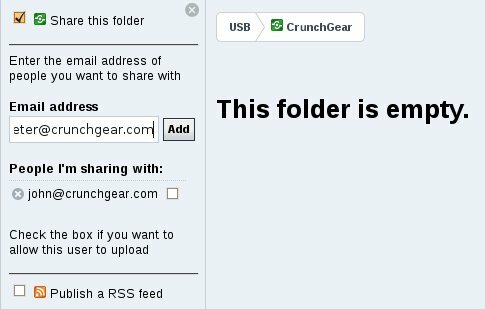 Another nifty feature is the creation of an RSS feed for the items you’re sharing. What good is this, you ask? Make a folder for digital photos, share the folder, create an RSS feed for it, and then point the digital photo frame at grandma’s house to the RSS feed. Instant updates for all the new photos you take. Windows and Mac users can download client software to make their PogoPlug look like a mapped drive within their system. I didn’t try this — remember, I’m a Linux user! — but it sounds like a nice offering to round out the features of the device. There’s also an iPhone application available, so that you can access your PogoPlug’s contents from your phone. That’s a neat feature, and I hope other NAS manufacturers follow suit. There aren’t a lot of controls to twiddle, as the PogoPlug is really going for ease-of-use. In fact, the “Settings” page only lets you change your email address, screen name and password, and to register additional PogoPlugs. The last is nice: you can manage multiple PogoPlugs from a single account (one for you, one for mom and dad’s house, maybe). The PogoPlug works seamlessly through any home firewall or router configuration, and doesn’t require you to open ports, forward traffic, or in any way modify your configuration. Complaints: I’ve got a few minor complaints about the PogoPlug. First, all traffic gets routed through the PogoPlug website. Yes, that’s how they get away with making this thing so bloody easy to use, but it also means that all of my use of my device passes through their system. I’m glad there’s no subscription to the PogoPlug service, but all the same I’d rather not have them involved when I’m using my device. Who knows what sorts of monitoring they may be performing? Also, what’ll happen to my PogoPlug should the company close its doors? My other beef is that NAS appliances like this sit in a really weird space in terms of network functionality. For a little bit more money (and a moderate amount of time and energy), I can set up a full-blown server, with dedicated user accounts and more featureful services for various things: web server, FTP, dedicated BitTorrent client, Subversion repository, and more. Heck, just about anyone could configure a Mac Mini or small Windows machine, and use SCP or FTP to transfer files to and from the unit. As a bonus, such a system could run Boxee and be an all-in-one media server, rather than just a file server. You could use the PogoPlug as a backup device, copying important files from your desktops and/or laptops to it, but I don’t see a lot of people doing this (although the client software for Windows and Mac may make this a more viable option than I give it credit for). Bottom Line: for a C-note, the PogoPlug is a pretty good option for a no-fuss Internet-connected NAS. 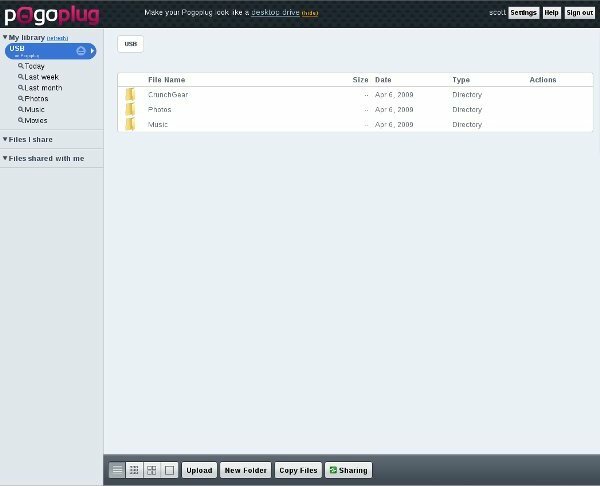 You could easily get mom or dad to send and receive files via a PogoPlug. It’s no replacement for a full blown server for the die-hard geeks, but the ease of use and diminutive form factor make this a strong contender for the casual user.